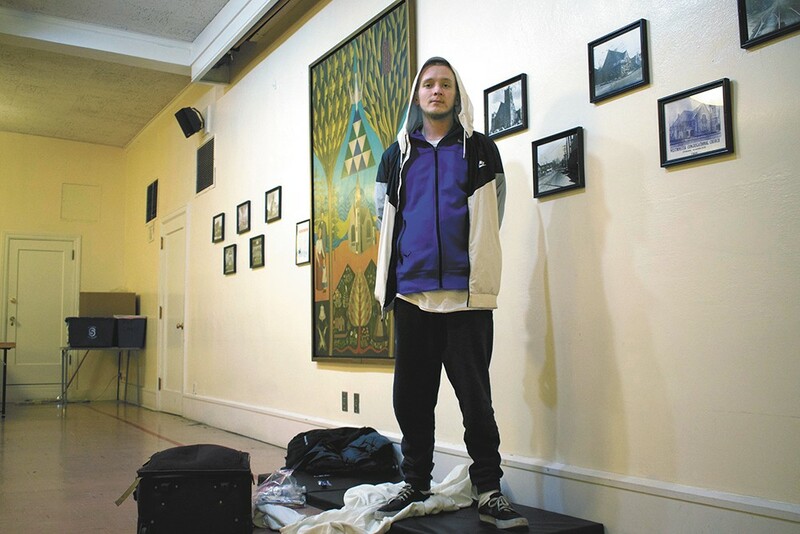 Timothy King, 24, says he has been homeless since the death of his father last summer. All of Timothy King's belongings — some clothes, a pair of boots, a toothbrush — fit into a suitcase small enough to carry onto an airplane. Its wheels were meant for the smooth tile floors in airports, not the rough city streets of Spokane in winter. King, 24, brings the suitcase wherever he goes. That might be across town for a shower at a local center for homeless youth, or the downtown mall, or wherever he can find his next meal. But he tries not to linger on public streets or sidewalks downtown. There are a couple reasons for that. One, it "doesn't look good," he says. And two, it will soon be against the law. "I'm not a criminal or anything like that," he says. In November, the Spokane City Council voted to suspend an ordinance that allows police to cite people who sleep or lie on downtown streets and sidewalks. The law, commonly referred to as "sit-lie," can only be enforced when shelter space is available, and council members decided to erase any ambiguity in that interpretation by suspending it all together this winter until more shelter space was available. Now, with the opening of several warming centers, the city plans to enforce the law again starting Feb. 8. But it's debatable whether the warming centers count as "shelter space" for people like King. He sleeps on a mat at Westminster Congregational Church, with his suitcase at arm's length because there's no storage room. And while the warming centers provide a place for the homeless to sleep at night, sit-lie isn't enforced at night, but only between 6 am and midnight. Councilwoman Kate Burke, who has always been against the sit-lie law, argues it's an injustice to homeless people. "Where are they supposed to go?" she says. "I can't imagine, in this weather, being pushed out of everywhere you go. It would feel so burdensome and irritating that you're being treated like that as a human." It's unconstitutional to prosecute people for sleeping on the streets if they have nowhere else to go, a federal appeals court ruled last year. But Spokane's sit-lie ordinance attempts to work around that by specifying that it's only enforceable when shelter space is available for the homeless. Proponents of the sit-lie law argue that it's a critical tool to compel homeless individuals to seek services that could help them. Those who are cited under the law in Spokane are directed to community court, where they can have access to services they may need. Others, however, argue it criminalizes homelessness when they have few other options. In 2018, the city handed out more than 200 sit-lie citations, more than double the year prior, and double that of 2014, 2015 and 2016 combined. On Sept 1, the city's main 24/7 shelter, House of Charity, run by Catholic Charities, ended its 24/7 model. Yet despite the loss of shelter space, city records provided to the Inlander show that sit-lie citations continued until Nov. 19, the day City Council decided to suspend the law. Councilman Breean Beggs says the council suspended it because it was unclear when there was adequate space or not. Even Beggs acknowledges that it's not clear in the city ordinance what "shelter space" means exactly. "That's kind of an open question that might require some amendment," Beggs says. Beggs personally doesn't count warming center spaces as shelter beds. Warming centers keep people safe while they sleep at night, but they don't have the services that shelters do. Beggs visited Truth Ministries recently, a shelter east of downtown on Sprague. And the difference between that and a warming center is stark. While warming shelters like Salem Lutheran and Westminster can't offer food or storage inside, shelters like Truth Ministries on Sprague do. Truth Ministries has 54 beds, not mats on the ground. It offers a meal and shower to everyone who stays there. Usually, there are rules to get in, including no weapons or drugs, and that those who stay there must have a goal to get off the street. But Truth Ministries relaxes those rules in winter, says director Marty McKinney. So if warming centers don't count as "shelter" spaces, can sit-lie be enforced now just because of the additional warming centers? "Someone could challenge that," Beggs says. "I would imagine someone will, probably." "I can't imagine, in this weather, being pushed out of everywhere you go. It would feel so burdensome and irritating that you're being treated like that as a human." City Council President Ben Stuckart, however, remains confident in the city's legal analysis that says it is enforceable. He says the intent on the night City Council suspended sit-lie was always to start it again once warming shelters opened up. And now, there are 275 warming shelter spaces. When he hears arguments that those aren't adequate, he feels like it's moving the goalposts. "We didn't say permanent shelter beds. That wasn't the ask. The people who asked us were concerned directly about warming centers not being opened," Stuckart says. "You don't get to change the terms of everything because now you want more." Mike Shaw, executive director of the Guardians Foundation, which runs warming shelters in the city, has mixed feelings on sit-lie. On the one hand, he says it does criminalize homelessness, especially for people with few options during the day. "You can't enforce that without places for people to go," Shaw says. "During the day, there's still really no place for them to go." But on the other hand, he sees why it might work for some people. At the warming center on South Cannon Street, he says people leave the shelter at 7 am and then, with nowhere to go, sit right down on the sidewalk. "Not one of them is looking for services," Shaw says. "They're just waiting for my doors to open back up at 7 at night. Sit-lie would be a tool to say, 'Hey guys, let's go find services.'" Mark Richard, president of the Downtown Spokane Partnership, argues the sit-lie ordinance should have never been suspended in the first place because the ordinance itself specifies that enforcement can occur only when there's no space available in shelters. He's in favor of sit-lie being enforced again, even if it's during the day when warming centers aren't open. "Its intention is to compel people to get under a roof," even if the time doesn't align perfectly, he says. While Burke hopes the sit-lie law is erased altogether, Beggs says he thinks it will be amended. His suggestion would include two amendments: one that changes the definition of "shelter" to an actual bed, and another that changes the ordinance to only enforce it if someone is blocking a street or sidewalk, not just standing on the corner not causing any problems. Stuckart, however, says there's no consensus on the council yet for any changes. What there is consensus on? A new 24/7 shelter that gives the homeless a place to be all the time. The warming centers will close in April unless the city decides to keep them open for longer. Yet Stuckart says the goal is to open a 24/7 shelter by July 1. The original print version of this article was headlined "Give Me Shelter"